Let’s look at some numbers. According to the most recent statistics provided by the American Heart Association, 88% of cardiac arrests happen at home, where there are no doctors or nurses, which is why it is so vitally important that everyone be skilled in providing CPR. 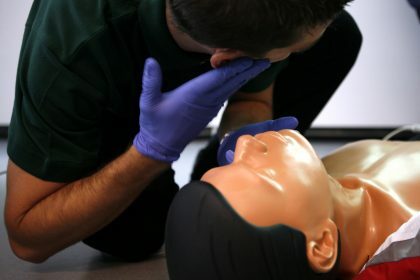 The average bystander that is skilled in CPR can triple the chance that a victim survives a cardiac arrest, however the chances of receiving CPR from a non-professional in an out-of-hospital cardiac arrest situation is only approximately 32%. Furthermore, of those victims that receive CPR outside of a hospital, less than 8% survive. According to the National Institute of Health, in a hospital setting, approximately 15% of patients are resuscitated and survive to discharge, a number that has remained relatively stable over the past three decades. 1. Aspiration & Vomiting: The most frequent occurrence during CPR, vomiting can present a danger to the victim. Since the victim is unconscious, he is unable to clear the vomit from his mouth and, if not cleared, the victim is likely to aspirate (inhale) it into his lungs, blocking the airway and leading to possible infection. 2. Broken Ribs Bone: The force of chest compressions is likely to break ribs. In the elderly, this is significantly more common due to the brittleness and weakness of their bones. Broken ribs present a danger because a broken rib could possibly puncture or lacerate (cut) a lung, the spleen or the liver. They are also very painful. 3. Internal Brain Injuries: Since CPR leaves the brain receiving 5% less oxygen than normal, brain damage is possible. Brain damage occurs within 4 to 6 minutes from the time the brain is deprived of oxygen, and after 10 minutes, it definitely occurs. This can lead to long-term health complications. 4. Abdominal Distension: As a result of air being forced into the lungs, the abdomen usually becomes distended (bloated) and full of air during CPR, leading to compression of the lungs (making ventilation more difficult) and an increased chance of vomiting. 5. Aspiration Pneumonia: The result of vomit and foreign objects (like a person’s own teeth) being inhaled into the lungs can lead to aspiration pneumonia, which can be very dangerous to a victim’s health and could complicate recovery, or even be fatal, even if the victim does survive CPR. Overall, all of these side effects mean that, if a person does survive CPR, their long-term health could suffer and they may be alive, but it is possible that their overall health and quality of life is significantly affected. Additionally, the psychological ramifications of a near-death experience can greatly affect a survivor, leading to anxiety, stress and depression, among other psychological conditions. Thus, it is important to have the knowledge of the side effects of CPR before performing it to anyone. Hence, a proper CPR training is always recommended for everyone.